Since my baby was born, I have been working from home on small projects here and there. The journey has not been smooth, nor has it yielded my desired income. I had hoped that 6 weeks after giving birth, I would have a structure in place to acquire that perfect work-from-home opportunity within a short time frame. In fact the road to my dream home-based income has been paved with all sorts of bumps. A year later and I am still trying to figure things out. The good news is that I have done some self-introspection and have charted a new direction. I feel energized. The first few months of my daughter’s birth involved an adjustment to motherhood, and getting to know my baby. I spent weeks learning and adjusting to her sleep patterns. I have enjoyed getting acquainted with her vivacious and demanding personality. I even figured out what most of her cries mean. In between the joys of motherhood, the first few months involved desperate attempts to generate cash to cover bills while trying to figure out my dream home business that would bring in more income than just an hourly rate. During year one of my baby’s life, I learnt a few lessons. Lesson #1 Never settle for low paying work-from-home gigs: I made the mistake of accepting a low paying gig calling dealerships to set up appointments. The commissions never bumps up your hourly rate significantly. Those low paying hourly jobs are a waste of time especially if it requires a lot of energy. Phone jobs with a loud baby like mine – bad idea! You end up spending a lot of energy pacifying your baby and making phone calls. I found that at the end of the day after my baby went to sleep, I hardly had any energy to focus on what really mattered – the creation of my home-based business I can truly be passionate about. Without meaning to sound snobbish, I should be earning an MBA salary even working from home. If you have to accept a low paying work-from home job, create an exit plan that involves devoting an hour a day to looking for profitable gigs. Also, you can accept low paying gigs, if they are relevant to your proposed business or future career plans. I recently took a low paying social media gig for a small business because it’s a skill I want to cultivate. I ended up enjoying the project. Lesson #2 Never accept a low paying writing job: This ties in to Lesson #1. I accepted a writing job for $15/hour to help a hypnotherapist revamp his website. He expected me to do a little bit of research, and it was time consuming to write original pieces based on a poorly written website. I was so thankful when that gig died a quick death. He went from loving my writing style to hating it. If you are an excellent writer like me, you deserve at least $30 per hour. I did get a writing gig for $1,000. Too bad it was one time project. Lesson #3 Find Projects That Have Flexible Working Hours So That You Can Take Long Breaks To Be with Your Baby: I am currently working on a sales project that ironically involves making a lot of phone calls. The pay is fairly decent, and I am enjoying the job. My hours are flexible enough to where I can take 2 hours off to do something special with my baby – a trip to the mall to go for a stroll, story time at the local library, and just quality time at home together. Lesson #4 Develop a Vision: I have a vision that I need to follow through on. It involves creating a business to help Israeli companies to establish a presence in the U.S. markets, creating a baby-product related business, and creating a recruiting business that will enable moms to stay at home with their babies while earning a decent salary. I am exploring multiple options with the hope that one or all of these will succeed. Now that I have a vision, my next step is to develop and implement a strategic plan and monitor my progress. 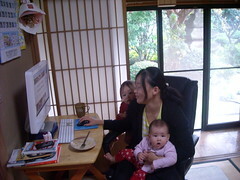 I look forward to blogging about my experiences starting a business as a mompreneur. Lesson #5 Be Confident About Yourself and Optimistic: Never ever let someone else’s opinions side-track you. Be true to your vision and do not accept pessimistic statements from well meaning friends and family members. If you have a dream to be a successful mompreneur, persevere. If you fail, keep trying. If you feel alone, keep moving forward. If like me you have negative thoughts stemming from childhood or past abusive relationships, let them go. They can affect your self-confidence and create self-doubt. I spend a lot of time striving to overcome my negative thought patterns. This includes 15 minutes a day asking GOD to help me overcome my weaknesses and negative thought patterns. A self-confident mompreneur will attract success. I can see myself succeed and I refuse to allow anything to sabotage my vision. Where was this post when I came home 8 years ago!? Great post! I liked this! Working from home is harder than people imagine! I have learned to schedule work around my realistic family scheule and loud times. I also liked you giving people realistic views on income. I know! It is challenging especially to earn the income you desire. I love that you own your awesome and that you are asking for what you deserve! Thank you for these words. I don’t work exclusively from home but do tend to downplay some of my positives. Not anymore! Great advice. I’m single w/o kids and I work from home because I was having trouble finding a job outside of home. I made my work; writing, virtual assistant, & another biz and now am on the road to financial freedom. I use the 90 Minute Work Cycle to stay on task. It sounds like you are determined and I look forward to hearing your journey! These are great tips, and I especially agree with #3. When you work from home, it’s imperative that you find time, even during working hours, to tend to the needs of your family.